Last week A and I met up with with one of his newly favorite friends (and his super cool mom, whose awesome idea this was!) for the most perfect play date. 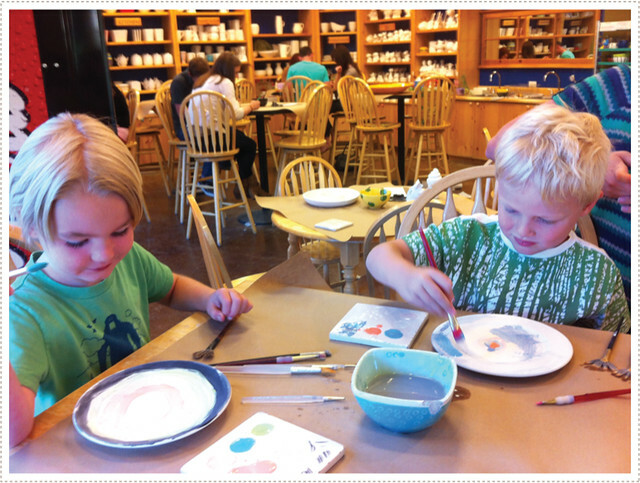 Together we made custom painted plates for Father's Day at Color Me Mine, a DIY ceramic painting studio. We actually had the dad's with us but sent them away with the wee ones so we could work on secret surprises (Little O was having a hard time sitting still long enough to create, but I think he'd love this otherwise. He was entranced by the many many pottery options and just couldn't leave them be, so away to play in the fountains he went). I always love creating custom pottery and find myself wanting to spend hours in these places, scheming up entire lines of ceramic ware. Lucky for us however we had two 5-6 yr olds to keep us moving right along. A was more than into this project and loved picking out colors for his plate. I think having a buddy there with him just made creating that much more magical. He didn't hesitate to jump right into painting and I love what he came up with. He's really been into layering outlines of colors, one after the other in what ever shape the art material is in. So for example, he's done a number of rectangular book marks with several layers of colorful rectangles inside one another. 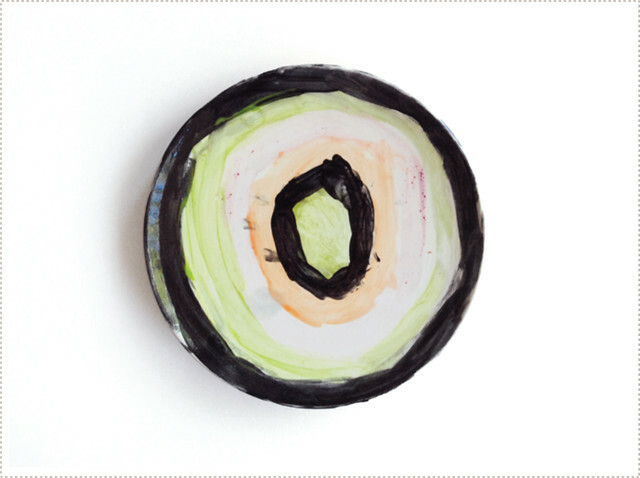 And with this circular ceramic plate, he created a number of various circular rings stacked within each other. I really like his choice of bringing the black and green back into the color pattern right in the very center. As for the back of the plate, he enthusiastically painted the different portions of the plate (after trying for a dotted motif around the rim that just didn't turn out to his liking). 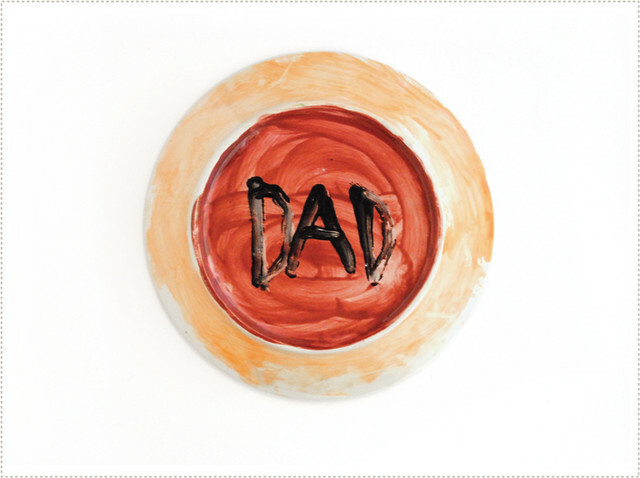 He then wrote "DAD" in bold black letters and I just love it. I'm pretty positive that Jon will love it as well (who I've forbidden to look at this post until after Father's Day...so if there are typos it's because I didn't have my trusty proof reader to keep things in check for me on this one). I knew that I wanted to make something for Jon as well that could be from all of us as a family (and something that Little O could present to him so he didn't feel left out for not having a plate - although I'm sure I'll have him make something with his own hands just for Jon, at some point). 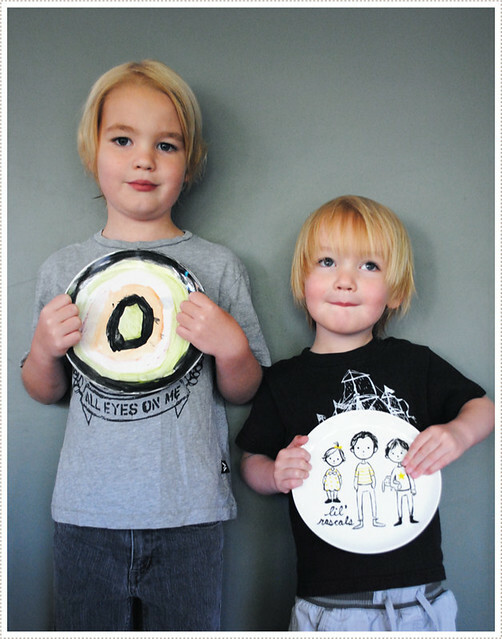 After much thought and debate I decided it would be fun to do simple illustrated portraits of the kids. And if we are representing all the kids, I knew I had to put our baby girl to be on there as well, which I'm sure will make Jon very happy indeed. And I have to say, it was pretty exhilarating for me to do this as well as it really helped to sink in the idea that yes, we are indeed adding another lil' rascal to our bunch! Zoiks! I'm getting more excited every day! (which is a good thing because I also just get bigger and more uncomfortable as the days progress on. Boy I'm not looking forward to the hot months of July and August...). 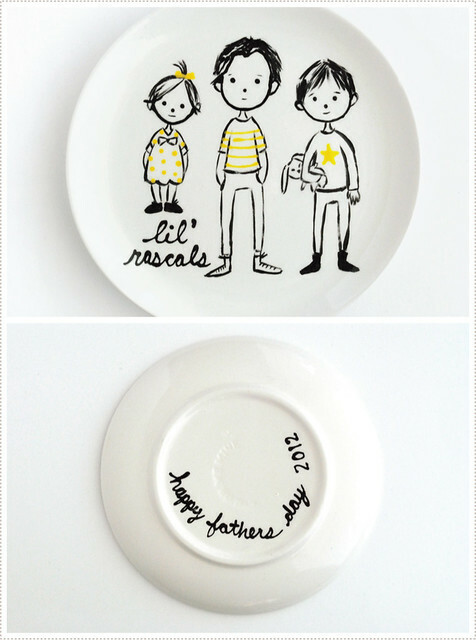 I finished the plate off with a "happy Father's Day" tribute on the back, commemorating this year, 2012. I think it might be a fun tradition to do one of these every year and show how the kids grow and change a bit each year. Wouldn't that be the most special collection ever!? I think I just might have to do this. And if you are wanting to do something similar for a special dad in your life, there are a number of approaches you can take. 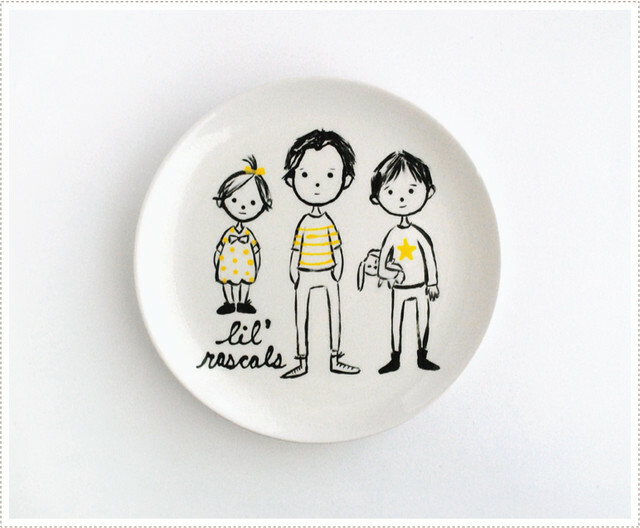 Like me you can grab some friends for a play date at your local DIY pottery studio or you can create you own version at home with a simple white plate and some porcelaine paint markers, similar to what I did for our 2011 Santa cookie plate (which I'll now have to update at the end of this year!). And don't worry about perfection. 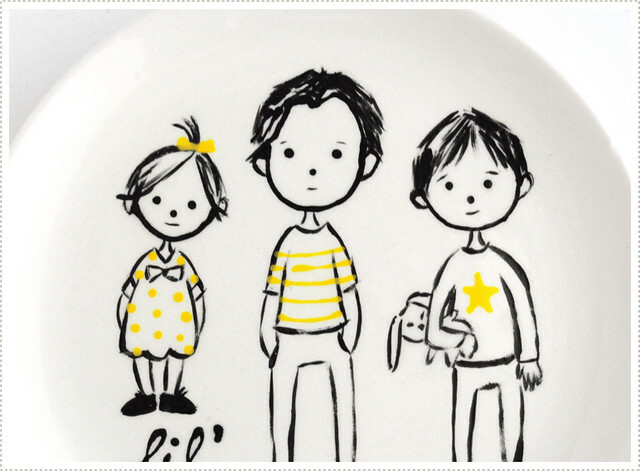 I think simple stick figures could be really cute as well as having your Littles draw on their own version each family member (similar to what A did for his embroidered family portrait pillow). You'll cherish it! Wow!Lovely gift ideas. Nice post.